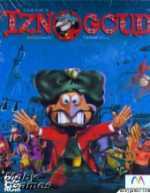 You are the Grand Vizier Iznogoud, whose one and only aim is to depose the Caliph of Baghdad and become Caliph in his place. To do this, you must face many challenges and enemies in your path. You control Iznogoud in a very colorful platform environment, moving, jumping, dodging and ducking obstacles all around you. You can pick up objects that increase your life points as well as weapons which you can throw at your many opponents. Each level has a level boss that you must defeat to move on to the next level. There are also passwords given at the end of each level. You are on a timer; so move quickly, collecting the coins and objects along the way.